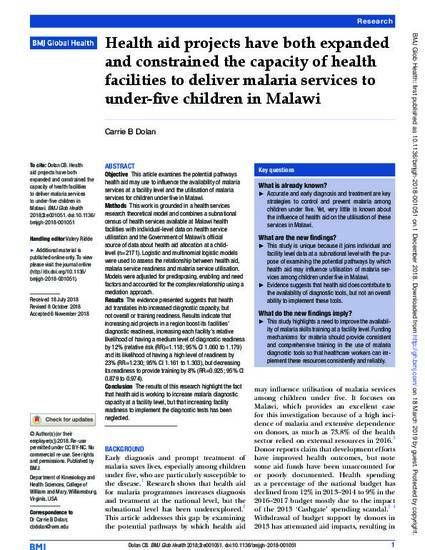 Objective This article examines the potential pathways health aid may use to influence the availability of malaria services at a facility level and the utilisation of malaria services for children under five in Malawi. Methods This work is grounded in a health services research theoretical model and combines a subnational census of health services available at Malawi health facilities with individual-level data on health service utilisation and the Government of Malawi’s official source of data about health aid allocation at a child-level (n=2171). Logistic and multinomial logistic models were used to assess the relationship between health aid, malaria service readiness and malaria service utilisation. Models were adjusted for predisposing, enabling and need factors and accounted for the complex relationship using a mediation approach. Results The evidence presented suggests that health aid translates into increased diagnostic capacity, but not overall or training readiness. Results indicate that increasing aid projects in a region boost its facilities’ diagnostic readiness, increasing each facility’s relative likelihood of having a medium level of diagnostic readiness by 12% (relative risk (RR)=1.118; 95% CI 1.060 to 1.179) and its likelihood of having a high level of readiness by 23% (RR=1.230; 95% CI 1.161 to 1.303), but decreasing its readiness to provide training by 8% (RR=0.925; 95% CI 0.879 to 0.974). Conclusion The results of this research highlight the fact that health aid is working to increase malaria diagnostic capacity at a facility level, but that increasing facility readiness to implement the diagnostic tests has been neglected.